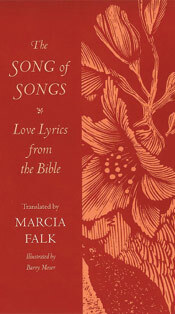 "Marcia Falk's translation of the Song of Songs is a beautiful and sensual poem in its own right . . . The strongly positive sense of 'blackness,' the full expression of female eroticism, speak to our time with particular sympathy. Above all this new version reminds us why the images and spirit of the Song have endured." Marcia Falk's new translation of the ancient Song of Songs deepens our appreciation and understanding of one of the world's most celebrated—and controversial—collections of poetry. The only book of love poems in the Bible, the Song of Songs also bears the distinction of being the only biblical book in which women speak more than half the lines. In this bilingual edition, illustrated with wood engravings by award-winning book artist Barry Moser, Marcia Falk combines scholarship with poetic craft to shed new light on the structure and content of this classic book. Dividing it into thirty-one poems, she gives each poem its own voice in English verse. Readers interested in learning about the original text as well as the translator's creative process should see the clothbound edition published by Harper in 1990, entitled The Song of Songs: A New Translation and Interpretation, which contains the translator's commentary. This book is out of print, but available in many libraries. In it, she illuminates the Song's major themes and motifs and shows how she arrived at her own interpretations and translations. She explains why the Song should be seen as a collection of lyrics, and she shows how all the poems—striking in their appeal to the senses—are especially remarkable for their lack of sexual stereotyping and their expression of mutuality in relationships between women and men. Her discussions open up the meaning of the poetry for general readers and Bible scholars alike. "Marcia Falk, through her courage, scholarship, and artistry, has given us a gift beyond price: the Song of Songs in its naked beauty." "Marcia Falk is a master of Hebrew language as well as a poet in her own right. This combination lifts her work light years above the usual new translation of Bible literature . . . Marcia Falk's rendering is an insightful and inspired re-creation, not an 'imitation' in the Poundian sense. Her direct access, as a Hebraist, to the original, and her intuitive access, as a distinguished poet, to the precision and nuance and immediacy of word, phrase, and echo, make her the ideal translator for contemporary ears. She places high scholarship and accuracy in the service of great purity and art . . . It seems to me that Marcia Falk's Song of Songs has a lasting life ahead of it in lovers' laps, whether those lovers are lovers of the literature of the Bible, or lovers of the clear sound of an American poet in intimate embrace with a tradition, or simply lovers." 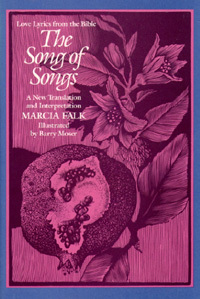 "Marcia Falk's new translation of the Song of Songs is part of the larger effort poets today are making to break away from the pedantry of scholarly biblical translation in the past century and to give us new versions, more accurate than the classic ones (such as the King James, the Douay, et cetera), but in modern forms and idioms . . . The whole effect is right . . . [This book] brings us images of our sweetest history, far back and far away, truly exotic and still alive with amorous and mystical desire." "A very affecting and successful set of lyrics whose effect on me more than once was to uncover new possibilities in the original Hebrew. What Falk brings to the text in a measure exceeding that of professional scholars is poetic sensibility and expressiveness. These have enabled her to discover symbols (with which the text is rife), and to convey them into English evocative of the charge of the Hebrew beyond what I have seen in other current Bible translations. Her combination of unslavish fidelity to the received Hebrew, poetic understanding, and deftness at translating is, to my knowledge, unique." "Falk's intuition and poetic sensibility are right on the mark, her interpretations brilliant and startling, and the resultant verses satisfying as never before . . . [she has] created engaging translations that open the gates of time and language and enable us to step inside a garden of delight." "Marcia Falk's translation is unique for its combination of solid Hebraic scholarship and pure poetic idiom. In other words, it reproduces the poetic quality of the ancient Hebrew in authentic contemporary English poetry. When it departs from a more or less literal translation of the Hebrew, it does so in order to fulfill the translation ideal of many writers: to reproduce a poem with a poem, not with a more literal text that is something less than a poem. Marcia Falk's version of the Song of Songs goes farther than any other translation I know to replicate the sensuousness of the original . . . It rests on a very careful and sensitive literary and linguistic analysis of the Hebrew text . . . There is no other translation of the Song of Songs that I know that can produce in an English-speaking audience the same sorts of experiences that an audience familiar with the Hebrew original would feel." "This new verse translation of the Song of Songs, with critical commentary, is a treasure. . . . Departing from both Jewish and Christian interpretations of the Song as spiritual allegory, Marcia Falk has explored the text on its primary level of meaning, as love poems. These she has turned into exquisite verse. She presents the reader with a moving translation that admirably fills the gap between scholarship and poetic sensitivity."